Capillary Tubing - Ziggy's Tubes and Wires, Inc.
Capillary tubing is extruded from a billet of type 316L stainless steel and is seamless and fully annealed. The material is re-drawn through a die, heat-treated in a vacuum furnace and worked, cleaned, and re-worked until reduced to size. Annealing is a process wich removes the temper, or stiffness from the tubing, resulting in a tube which can be easily bent and formed. Capillary tubing has a very small inside diameter and a very heavy wall. Primarily used in high pressure applications such as HPLC and gas chromatography, this tubing can be used wherever a small ID tubing is required. The 0.064”OD makes connecting to this tubing simple; use standard 1/16” compression fittings. 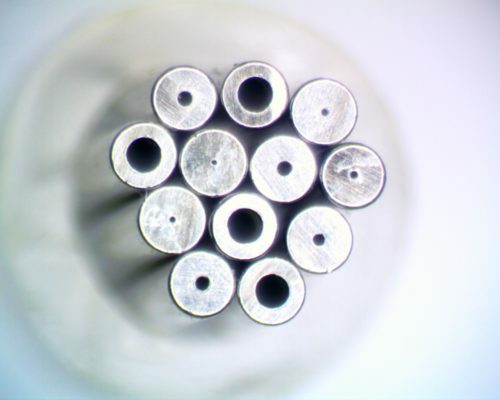 The chemical composition of capillary tubing makes it a perfect material for laser welding tubes and assemblies. Note: Citric Passivation is available upon request. Return of custom parts or stock material requires preauthorization.